Leighton Buzzard’s hopes of taking the Cherwell League Division 2 crown were dealt a hammer blow on Saturday as they were soundly beaten by title rivals Challow and Childrey. The 104 run defeat sees them tumble not only from top spot, but also from the promotion places, now sitting third with just two games remaining of the season. Such is the nature of the division though, there are just 20 points separating Leighton and leaders Buckingham, while there are only eight points between Town and Challow, who leapfrog them into second place. Captain Jack Kempster won the toss and invited the hosts to bat first and soon Town struck as Dan Scott trapped name LBW without scoring. This was a good as it got for Town as opposing captain and danger man Gordon came to the wicket and in partnership with Bryan (44) steadied the ship. Together the pair put on over 100 runs in partnership to put the hosts into a position of strength. Spinner Lee Selfe aided by some excellent catching then gave Town a glimmer of getting back into the game with three quick wickets, but was unable to dismiss captain Gordon who soon reached his century. Town struggled to contain the Challow batmen in the last 10 overs of the innings and thanks to some big hitting propelled the score to an imposing 259 off their allotted overs. Gordon ending with a magnificent 131 not out, leaving Leighton with an uphill task to get a positive result from the game. But Town’s reply never really got off the ground as they lost wickets at regular intervals and never looked like getting anywhere the victory target. Only Greg Proudfoot showed any resistance as the number three batsman struck a confident 58. There was also a good lower partnership from Selfe (44) and Anthony Francis (16) who managed to take the score to a respectable 148, still well short of the Challow total. 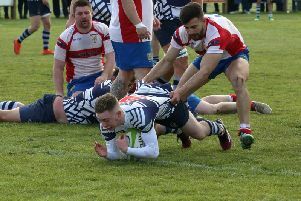 The defeat means that promotion has now been taken out of Town’s hands and they need to win both of their remaining matches and rely on other results to go their way if they are to secure an immediate return to Division 1. Jack Cowley took 4-37 from just seven overs as Leighton Buzzard 2nds moved up to fourth in Division 5, beating Cropredy 2nds by 33 runs. Batting first Town posted a competitive 224 for 9 thanks mainly to an excellent innings of 105 not out from Riaan Krynauw. His knock spanning 139 balls with nine fours and one maximum. The visitors never looked likely like getting anywhere near Town’s total as wickets fell regularly and they were dismissed for 172. Pick of the bowlers was Cowley who put in fantastic spell of bowling to end with figures of 4-37 off his seven overs. Next Saturday, Leighton face a tough test against Abingdon Vale 2nds, who sit joint top of the Division 5 table with Cumnor 2nds.